With another season "The Big Break" under way on the Golf Channel, let's check in with two-time Big Breaker Nikki DiSanto. As we've told you before, Nikki has an eclectic and varied background that includes modeling and television work as a host of travel and lifestyle shows. Now Nikki's acting career is poised for a big step up. Because she's making her first appearance in a network series when she guests in the Thursday night (April 24) episode of the CBS juggernaut, "CSI: Crime Scene Investigation." Nikki plays the character of Valinda Carlisle. Check it out at 9 p.m. ET, or you can watch the episode online (after it airs) at www.cbs.com/primetime/csi. 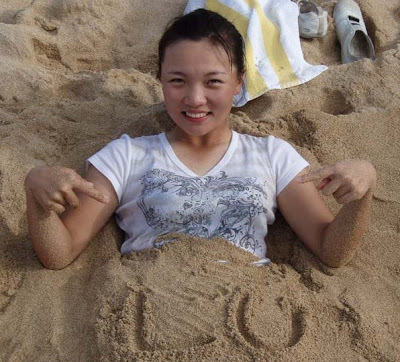 Hmmm, you might think a golfer wouldn't want to be buried in sand. But I suppose when you're having fun with friends on a beach - as Teresa Lu was the day this photo was taken - it's OK.
Teresa is a native of Taiwan (her first name is actually Hsiao-Ching) who has settled in California after coming to the U.S. to play the American Junior Golf Association Circuit in 2005. 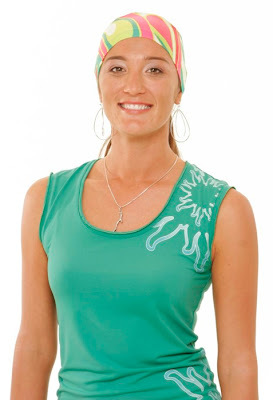 She turned pro the next year, and in 2007 was a rookie on the LPGA. So although she's only 20 now, Teresa is already in her second year on tour. 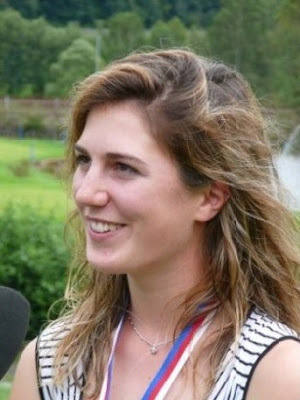 And on Sunday, she finished tied for third in the LPGA Ginn Open, her best finish to date. Lu's game appears to be a notch higher in 2008. 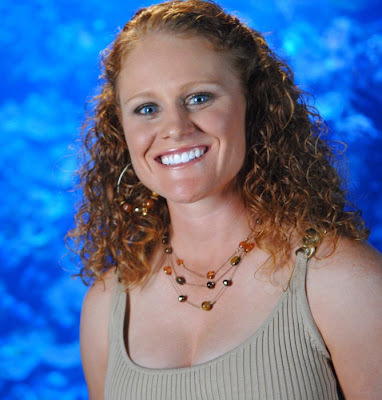 She also had a Top 10 earlier in the season, and has made seven of seven cuts so far, after missing 10 cuts in 2007. 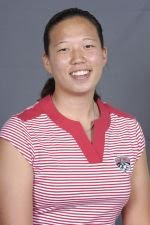 Britney Choy is a Hawaii native who plays for the University of New Mexico women's golf team. A sophomore, Britney missed most of her freshman season and half this season following back surgery last year. But she returned in time to play all of the 2008 Spring tournaments. She's also a mean ukelele player. Following are our five questions, and Britney's five answers. First things first: How's your back? And what kind of exercises or stretches are you doing to keep it healthy now? My back is completely healed. I don't have any pain like I used to. If anything, my back gets tight so I just do stretches. The surgery was the best path to take and I'm grateful that everything worked out in the end. When I first started rehab last October I had a special workout plan, but ever since December, I'm healthy as can be and working out a lot harder. I am definitely stronger than when I was healthy before the surgery. You finished Top 25 in your first collegiate tournament back, and posted a third and 11th in your two most recent events. Are you surprised at how quickly you've gotten back into form after missing so much time? Well, the first tournament in Tucson, I was pretty nervous because prior to that, I hadn't seen any tournament action since last June in Kentucky at the WAPL (U.S. Women's Amateur Public Links Championship). But I had a lot of time during the offseason back home in Hawaii to really work hard on my game. So definitely, finishing in the top 25 for the first time in my first tournament back was a great surprise, but I knew I had worked hard to get my game where it needed to be, so everything paid off in the end. After that tournament, I gained a lot more confidence and knew I could compete with the top players even though I didn't have as much experience, which is why I think I have performed well throughout the season. I noticed that you once won a junior long drive competition. So I'll guess that length is one of your strong points. What do you consider the strengths and weaknesses of your game right now? Haha, yeah I won a long drive contest in 2005 at the BIG "I" tournament in Indiana. I think I drove it 292 yards. I've always been a long ball hitter since I first picked up a club. I'd say my strengths are driving distance and wedges inside 100 yards. My putting is pretty close to being right up there, too. My weaknesses ... I don't know, it depends on the day! Hawaii seems to turn out great junior golfers all out of proportion to its population size. What's the explanation for the influx of golfers from Hawaii onto the national scene? Are they adding Tigerade to the drinking water over there? I think Hawaii turns out so many outstanding junior golfers because of the Hawaii State Junior Golf Association that Mary Bea Porter King has developed. I'm an alumni of the HSJGA and there have been some well-known names that have grown up through it, such as Tadd Fujikawa, Stephanie Kono, Kim Kim, and of course, Michelle Wie. For as small as Hawaii is, there is still just as tough of a competition as there is on the mainland, which is why I think the Hawaii junior golfers are already well-groomed when competing on the mainland. But the time and commitment that the players and their swing coaches put into their game is unbelievable. We really take advantage of the year-round weather and great golf courses Hawaii has to offer. What event or accomplishment in your golf career to date are you most proud of? Is it being name "Sock Tan World Champion" by WaggleRoom.com? Hahaha ... that sock tan award was a pretty big accomplishment =) ... hmm, the accomplishment that I'm most proud would have to be my high school state championship in 2004. I won it as a sophomore and it was on a tough golf course with a really tough field (Mari Chun, Amanda Wilson, and a few other names). I'm most proud of it because I feel like that win made me learn a lot about my game and myself as an individual. It made me realize that I can handle the pressure when it is the most crucial and I have the mental toughness to overcome it. Plus, I didn't realize how big winning the state high school championship was until afterwards - so it was pretty rewarding.